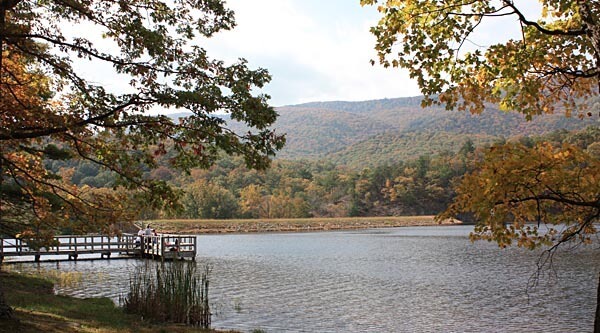 Douthat State Park was opened in June 1936. It was one of the original six state parks in Virginia. It is located in the Allegheny Mountains in Bath and Allegheny counties. It has been voted one of the nation’s 10 best parks. The park has a 50 acre lake for swimming, boating and is stocked for trout fishing. The park itself is 4,493 acres. The scenery is fantastic. Douthat Park has overnight facilities. You can rent a cabin or bring a tent or camper and camp. To keep yourself busy while in the park you can go mountain biking, which Douthat has become a premier destination for. There are twenty-four trails (45 miles) open for biking which is a great way to enjoy the scenery. You can go trout fishing in the stocked lake in season with a valid Virginia fishing license or daily permit. There is a boat launch available to the public. Canoes, paddleboats, Jonboats, hydrobikes and funyaks (like a kayak) can be rented. There are no gas powered boats allowed on the lake. When done fishing you an swim in the lake from Memorial day until Labor Day. If your not into fishing or a swimmer you can go hunting with a permit. There are over 43 miles of varied difficulty hiking trails. There are also horeseback riding trails on the Western side of the park. With all the activites in the park you are sure to get hungry. You can enjoy a picnic with items bought at the camp store. A restaurant is also available for those wanting someone else to do the cooking and clean up. In you are taking sovuniers home there is also a gift shop to look into. Last updated by Barb Jungbluth on 20 February, 2012 in Destinations.